Try these delicious varieties of sugar free mousse. 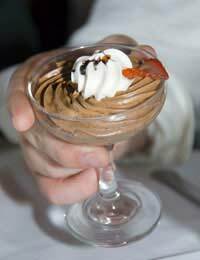 A nice, quick dessert to whip up, mousse comes in all sorts of flavours and can work well when made without sugar. Whether your tastes lie in fruity flavours or chocolate versions, mousse is the ideal dinner party dessert and family pudding.Although quick to prepare, however, you must leave enough time for the desserts to set. Four to five hours is usually enough time but to be sure you could whip them up the night before and allow them a good, long stint in the fridge. A firm favourite with young children, this recipe works best with bananas that are very ripe, even beginning to darken. The natural sugar in the bananas comes out, sweetening the dessert and giving it a strong banana flavour.For a different flavour altogether, try substituting fresh strawberries for your banana. Soft peaches and chestnut puree can work well too. Beginning by soaking your gelatin in your warm water. Then bring to the boil and stir gently until dissolved. In another bowl, mash your bananas then pulverise them until completely smooth with a hand blender. Whip your cream until firm then stir into the banana mixture. Gently fold in the liquid gelatin. Spoon your banana mousse into glasses and place in the fridge to set. Serve with whipped cream and slices of fresh banana. Anyone who loves chocolate will simply adore this sugar free chocolate mousse. It is an indulgent pudding but the flavour is superb and the servings do not have to be large to satisfy. Extra cream can be provided on the side or even sugar free vanilla ice-cream. Try adding a splash of orange liqueur at Christmas. Using a tbs of your cream make your cocoa into a paste in a small saucepan. Add the rest of your cream and heat gently until the cocoa has really dissolved. Leave to cool slightly then stir in your mascarpone cheese. Pour into moulds, leave to cool properly then place in the fridge. Decorate with whipped cream, a dusting of cocoa powder or shavings of diabetic chocolate. This is a light, zesty mousse that is a perfect summer dessert. It works well as a sugar free recipe, amounts of sweetener can be reduced if you like your lemon mousse tangy. Separate your yolks and whites, and then beat your yolks in a large bowl with your sweetener. Squeeze your lemons and grate a little of their zest. Add to the egg yolk mixture. Then stir in your cream. Whisk your egg whites until firm enough to stand up in peaks. Gently folk the whites into the lemon mixture. Pour into mousse glasses and place in the fridge to set.